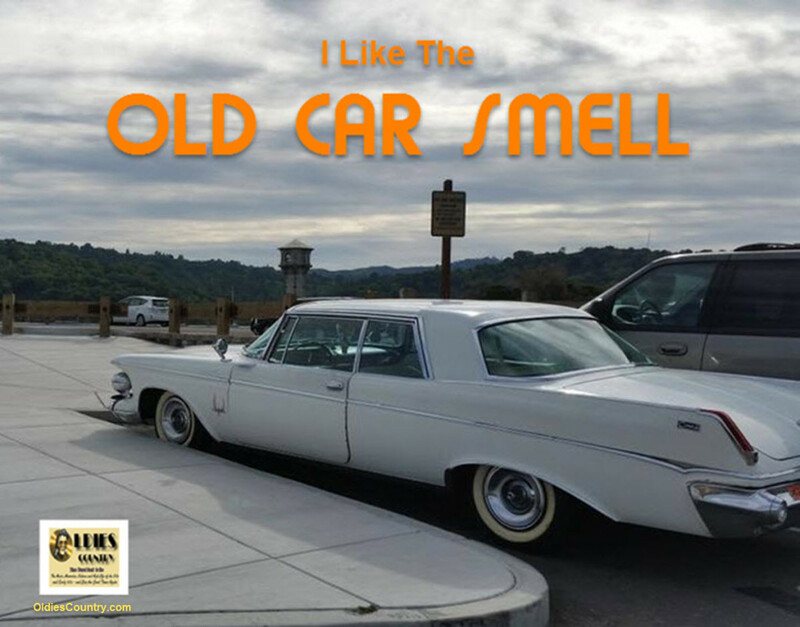 Last Sat night was a treat with Ride Radio (Seattle) and/or Top Shelf Oldies http://www.topshelfoldies.org/ playing the Top 50 from L.A. 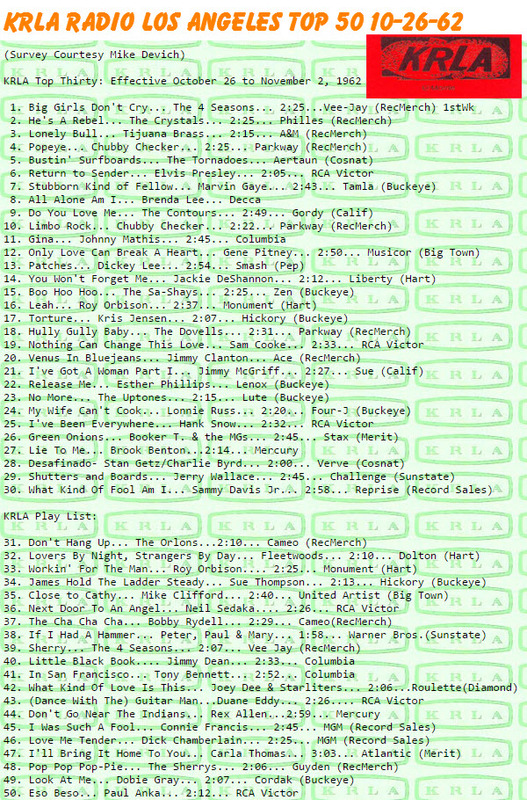 Powerhouse KRLA… One of the best surveys ever from this week in 1962 (Oct 26) as below…Fine guest DJ sitting in for the great Johnny G ….just heard #18 and #17 Torture by Kris Jensen and Leah by Roy Orbison. Don’t miss this Memory Flogger on future Saturnight nights, featurly various local, hometown surveys from the Golden Era… sounds you haven’t heard in years will bring back great memories. For now, we’ll highlight some of the show’s survey hits and other multi-media from that great LA station some of you probably grew up with. Let us know what you think and we’ll try to bring you some more ‘Hometown Countdowns ‘ surveys from various city and highlight some of the songs ini the future… After we hear the #50 hit, we’ll have a visit with original KRLA DJ , legendary Huggie Boy…. As promised, one of LA’s premier DJs, Huggy Boy, who was still announcing up to a few years ago. He has since passed. Others were Hunter Hancock, who also lived long and then there’s Art ‘Mr Oldies But Goodies’ Laboe, who is STILL announcing after all these years… to the mainly large chicano market that LOVES oldies in L.A. KRLA and KFWB were THE stations during the era. 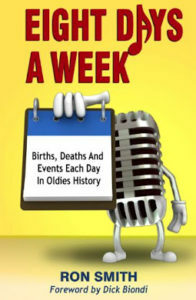 We’ll get into the DJs another time…https://youtu.be/zeJDDXJpe5A Hugg was a fixture at KRLA not only in the late 50s and early 60s but years later when KRLA lived on as an ‘oldies’ station. Hugg passed in 2012. Back to the KRLA survey from the week of Oct 26, 1962…. From “Portrait of Jimmy Dean”. Written by Jimmy Dean. And now, let’s hear an ‘extra’ or ‘bubbling under’ the week of Oct 26, 1962…. Instrumental. Record released in 1962. KRLA jingles, DJ intros and sign-offs from the Golden Era of ‘the 11110 Men’ https://youtu.be/-YzFGAEW24Y Note the DJ names like then fast-talking Bob Eubanks and and Wink Martindale,another game show host who actually had a hit record (know it?), . 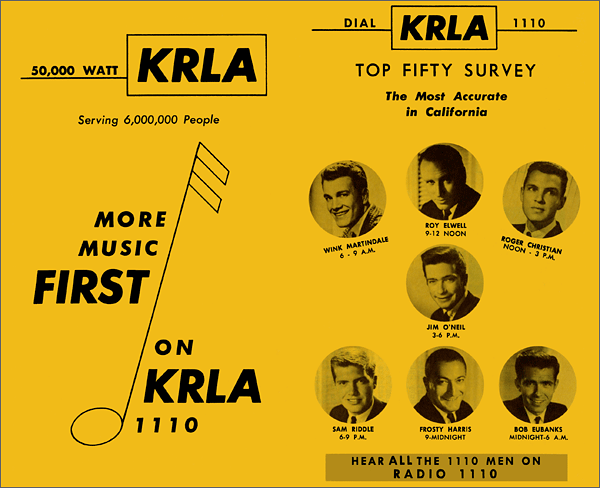 KRLA was a true powerhouse, competing heavily against KFWB and later KHJ. Now they’re all memories… The call letters amy still be there but that’s about it… but they live on here! 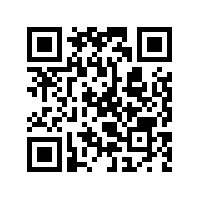 KRLA Radio Jingles, Intros, And SignOffs. Two dances in one from Mr. Ernest Evans. Great value! 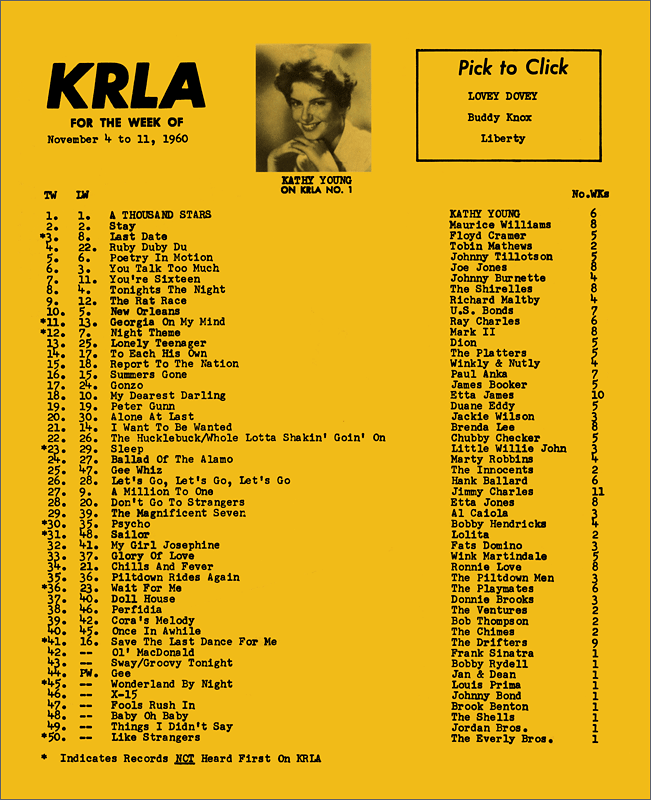 We’ll leave you with this survey from KRLA from 55 years ago next week… Thanks for listening and viewing .We’ll do it again, perhaps Saturday night simulcast with TOP SHELF OLDIES!